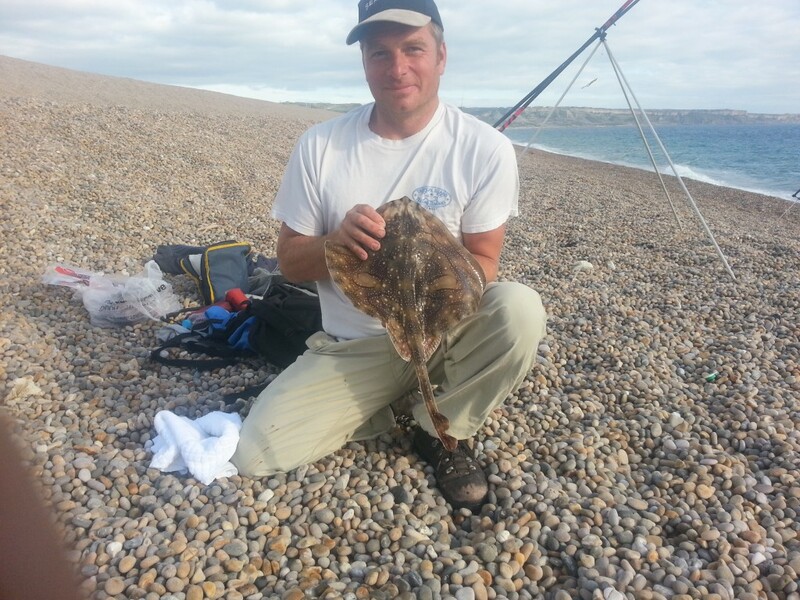 Fishing on Chesil Beach during August has been a bit more hit and miss than normal. It has been very inconsistent. A typical example is when my mate went and fished West Bexington on Saturday afternoon. He had a great session with a couple of Bass up to 6lb, Plaice, Dabs and Sole all before packing up at 9pm. He went back again to exactly the same spot the next day and had nothing but Pout and Dogfish. Regular contributor Leo, reported similar from the Ferrybridge end of Chesil, where he started catching Mackerel on his first cast, then caught nothing until his last cast when he pulled in this small but perfectly formed Undulate Ray. Sorry that the fishing forecast has been a bit irregular recently, but with school holidays and a full guiding program, I have been struggling to find the time. Things will be a bit quieter for me this week, so hopefully I can get back into more regular reports and finish of some of the fishing marks and tackle reviews that I have been promising. I have heard several reports of anglers catching Codling at Dragons Teeth last week. Many of you may think that this is unusual, but the same time last year we had a run of Codling. It only lasted about a week and it is probably the same shoal from last year, as most of the Codling caught were around 5lb. Chesil Beach forecast: Still plenty of Mackerel all along the beach with some Bass being caught on feathers amongst them. Sole and Rays are being caught from West Bexington and Cogden with Codling from Abbotsbury. I believe that the Codling will go as soon as the tides die off. Expect Gurnard and Bream from the Ferrybridge end of the beach. Portland: Over the past few days the wind has been from the North West, which is quite unusual for us. This has created some very good conditions for lure fishing on the West side of Portland. Especially around the rocks at Chesil Cove and towards the area known as Hallelujah Bay. The wind has pushed food and bait fish into the area, creating an ideal feeding area for Bass. As it can be shallow with lots of boulders then surface or shallow running lures will be the best choice. Marks at the Bill will also fish well, especially for Wrasse and Pollock. Portland Harbour: Not sure where the Bass have gone from the harbour, but they seem to have been replaced with Garfish and Scad. THe Scad are being caught around the bridge at night. Weymouth Bay: Both piers continue to produce lots of different species and are easy to fish marks. The harbour has some big Mullet cruising around in it. If I had the time I would be targeting them with bread or dog biscuit on the surface..
4 Responses to "Catch report & fishing forecast for Dorset including Chesil Beach, Portland & Weymouth"
where is the dragon teeth? Abbotsbury then keep walking to the left until you come to some concrete anti tank defences from the second world war. You can’t miss them. It is a long walk with kit, but can well be worth it. Nice one. How many squid did you have and did they come at dusk?